After our visit to the game reserve in Northern Botswana and our flight over the Okavango Delta in Maun we crossed the border with Namibia and drove in direction of Okaukuejo, the gateway to the Etosha National Park. Like the Chobe National Park in Botswana the Etosha National Park is one of Namibia's touristic drawcards and a beautiful part of the country to visit. The landscape here is more arid as the park is characterized by the Etosha Pan, a salt desert plain that envolves around a large salt lake. While the Etosha Pan dries up during the winter months it opens up and fills itself with water in spring or summertime after every rainfall turning it into a breeding ground for many birds and a gathering point for all kinds of wildlife and birdlife. 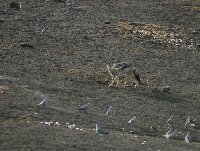 This is also why most birdlife lovers visit the Etosha National Park in summertime as most safari tours will drive up to the lake to spot the groups of pelicans that dominate the Etosha Pan in summer. 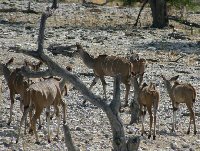 During the more dry months of the year the Etosha National Park remains a busy place and popular with tourists because bigger animals will also be forced to gather at the waterhole in search of some water for theirselves and their cubs or calfs. We had a lot of luck and were able to see a lot of animals at the lake from zebra's, antelopes and giraffes to wild foxes and wildebeests. From Okaukuejo we drove down southwest to Kamanjab for another wildlife adventure as we visited the Cheetah Park there, a different kind of wildlife park but a great experience as well! I'll post the pictures of Kamanjab and the cheetas on my next blog. Did you enjoy Etosha National Park Namibia and have you been on a holiday in Okaukuejo, Namibia?